NEW DELHI - Tens of thousands of Muslims who have fled violence in northern Myanmar are living in "extremely poor" conditions in neighbouring Bangladesh and need better shelter as the country's cyclone season approaches, the Red Cross said on Monday. Some 75,000 Rohingya people from Rakhine state have arrived in Bangladesh since Myanmar's military began a security operation last October, in response to what it says was an attack by Rohingya insurgents on border posts. 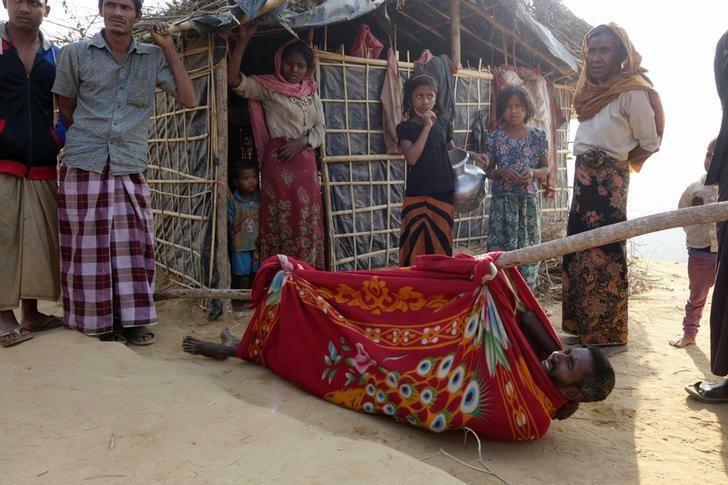 Many refugees are living in "unplanned and overcrowded settlements" in Bangladesh's Cox's Bazar district, said the Red Cross, and do not have adequate food, clean water, shelter materials or medicines. "Most don't have access to regular medical services and they are not getting enough food or sufficient nutrition," said Azmat Ulla, Bangladesh Head of the International Federation of Red Cross and Red Crescent Societies, in a statement. "Shelter is also a big issue. Many are living in sub-standard temporary structures. We need to scale up our support, particularly as there will be additional challenges ahead with the onset of the flood and cyclone season." Bangladesh's April to December cyclone season often causes mass evacuations from coastal low-lying villages and widespread crop and property damage. Cox's Bazar, located on the southeast coast, is prone to the cyclones formed in the Bay of Bengal -- and some of the most vulnerable residents are the thousands of displaced Rohingya people who live in make-shift camps in the district. Rohingya Muslims have been fleeing apartheid-like conditions in northwestern Myanmar, where they are denied citizenship, since the early 1990s. There are now at least 300,000 who have crossed into Bangladesh, according to the Red Cross. Around 30,000 are registered as refugees and are living in the two official camps in Cox's Bazar. But most are in makeshift camps or with host communities, said the Red Cross, where they lack access to basics such as toilets and healthcare. A U.N. report last month, based on interviews with survivors in Bangladesh, said the Myanmar army and police had committed mass killings and gang rapes of Rohingya in a campaign that may amount to crimes against humanity and ethnic cleansing.